DOVER, NEW JERSEY, SEPTEMBER 27, 2018 - Today, Casio G-SHOCK unveils the latest S Series collection as part of the new G-SHOCK Women’s line. An update to the previous S Series “Military Chic" collection, the timepieces boast an updated face shape – inspired by an iconic case shape within the standard G-SHOCK collection and come in four complementary color ways featuring a rose gold metallic mirrored face; matte black (GMDS6900MC-1), military green (GMDS6900MC-3), blush (GMDS6900MC-4) and white (GMDS6900MC-7). Based on the aesthetic of chunky fall jackets and oversized, military-inspired clothing with a 90s vibe, the timepieces boast an understated, sportswear-inspired design with a matte band and bezel, as well as rose-gold metallic accents on the face. The Military Chic Collection also features a clear digital display and electro-luminescent backlight for high visibility and ease of use in low-light conditions – making it the perfect accessory for any time of day or night. 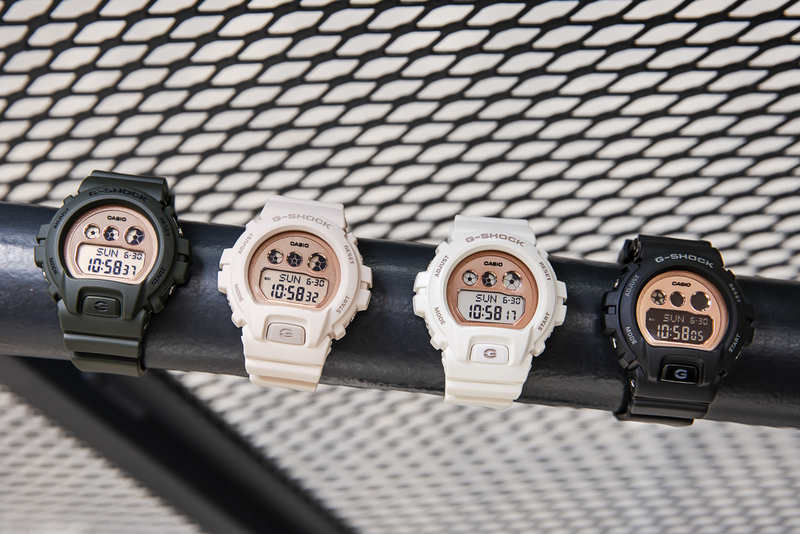 The GMDS6900MC-1, GMDS6900MC-3, GMDS6900MC-4 and GMDS6900MC-7 will retail for $99 and will be available for purchase starting this October at retailers including Macy’s, the G-SHOCK Soho Store, and gshock.com. For more information, visit https://www.gshock.com/collections/s-series..
Casio America, Inc., Dover, N.J., is the U.S. subsidiary of Casio Computer Co., Ltd., Tokyo, Japan, one of the world’s leading manufacturers of consumer electronics and business equipment solutions. Established in 1957, Casio America, Inc. markets calculators, keyboards, mobile presentation devices, disc title and label printers, watches, cash registers and other consumer electronic products. Casio has strived to realize its corporate creed of “creativity and contribution" through the introduction of innovative and imaginative products. For more information, visit www.casio.com.